This week I’m talking about how I’ve made it through to the public voting component for the Viva Las Vegas Pinup Contest. I’m so honoured and humbled to have made it this far, and hopefully with your help I might be lucky enough to make it over. To help make my dream come true, you can vote for me by clicking here! 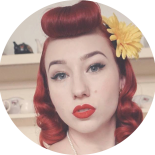 This entry was posted on January 12, 2017 by Miss Lady Lace in Pinup and tagged 1940's, 1950's, blogger, glamour, miss lady lace, miss lady laces pinup blog, perth burlesque, perth pinup, perth pinup blog, perth pinup community, pin up, pinup, pinup blog, pinup blogger, pinup fashion, pinup girl, pinup life, pinup lifestyle, pinup perth, red lips, retro blog, retro girl, retro glamour, the perth pinup community, victory rolls, vintage, vintage blog, vintage blogger, vintage fashion, vintage girl, vintage glamour, vintage perth, vintage pinup blog.